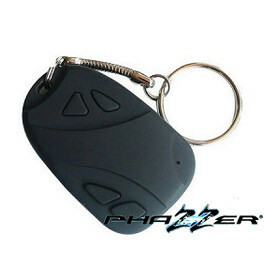 PhaZZer® DVR Keychain » Protective Solutions, Inc.
High quality full motion video with audio from your car keys. The DVR keychain has a built in 1.3 megapixel hidden camera and DVR capability with micro switch controls right at your fingertips. The unique wireless camcorder system will record full motion video towards where the operator points the device and will also recordcrisp clear audio from approx. 30 feet (depending on background noise).